This coffee drink really hit the spot. I was experimenting, trying to scratch an itch that began with a disappointment involving a new CoffeeMate creamer called Creme Brulee. I was not happy with it at all. But it left me with a taste for caramel. (For you mens... when you're PMSing, it's something like being preggers. If you have a craving, you'll move heaven and earth to satisfy it.) So, back to the store, I got myself some caramel topping. Seeing as how I was going all-out decadent, in full throes of PMS-don't-mess-with-me self-indulgence, I pulled out the Kahlua, whipped some cream, and ensconced myself in a corner with an old movie. The hubs, needless to say, said nothing during this whole process, although I'm sure he was wondering when the chocolate would appear. That came later. Pour 1 - 2 tblsp caramel into bottom of cup. Add espresso and stir. Add Kahlua. (If you really want to get decadent, add another 1/2 shot of Amaretto.) Whip heavy cream till fluffy, add 1-2 tsp sugar if desired. 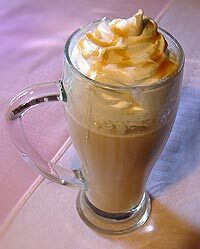 I also mixed 1 tsp of the caramel topping into the whipped cream. Put a generous dollop on top, and then drizzle caramel over all. 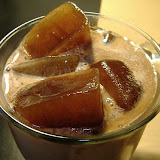 If you're a Kahlua lover, check this page for more Kahlua drink recipes. Sweet Jesus that Caramel Kahlua looks just right. The weather is 100 degrees in So. Cal and I hate it. If only I had some kahlua--- HEY Baileys! That would work just as well. I always go over board with the caramel. Yummmmmmy! Holy cow! I could go for one of those right now. :) (Or two or three...) Yum! A definite must-try. Yeowie kazowie does that look good. Thanks for the link! Bookmarking the gustatory decadence, mmmmmmmm.